It’s not as if it’s telling us much we didn’t know. That massive thing on the left tells pretty much the same story, doesn’t it? Well, maybe to a scientist or climate science geek it does. We can see how extraordinary the beginnings of the temperature spike look as well as how terrifying the prospects are. We’re familiar with the 21st century prospects, and are interested to see the new details on the post-glacial-max (Holocene) record. But what Randall Munro realized, what all of us missed, is how we could include some detail on the recent and imminent changes as well as the entire record, by the simple expedient of turning the graph on its side, stretching it enormously, and letting the mouse do the work of scrolling through it. It’s a Tuftean masterpiece – a new way of displaying data, one that is simply not suitable to the print medium. It treats the scroll affordance as a feature, not (as it usually is) an impediment. I’m assuming you’ve already seen this graphic. If you haven’t, scroll through the whole thing and come back here if you want. Again, the graph above and the one on the left have identical information, save for the archaeological color text, which is there to reinforce what your scroll wheel is already telling you, that form a human perspective, the Holocene spans a very very long time. But in the stretched view, the unusualness of the recent period is graspable along with the very calm global trajectory of the Holocene. Deniers always seem befuddled by this. They’re convinced “climate is always changing”. Well, yes, and the cells in your body are constantly changing too, but that’s no reason to lie down in front of an onrushing train. This graphic can go a long way toward enlightening the redeemably befuddled. The genius of it is in taking this stretched view to an extreme that wouldn’t be feasible in paper media. It allows for a visceral understanding of the different time scales involved in natural vs anthropogenic climate change. There are a lot of quibbles that can be addressed to this graphic, and they are little different form the ones addressed to the visualization we presented here 3 years ago. The key one is that the recent and foreseeable record are not as smoothed as the proxy record. There surely are bumps and wiggles in there that have been ironed smooth. But the point is that we have no reason to suspect that any of those wiggles was as rapid even as the one we have already seen; never mind the extrapolation we have every reason to expect. Kevin Anchukaitis and Chris Colose have discussed this in some detail on Twitter. And if that’s not enough quibbling for you, you can look into Greg Laden’s Facebook feed, where anthropologists and archaeologists are quibbling over details of Randal’s historical color text. Beside the point, you say? I do too, but different people have different perspectives on this. Kevin A’s defense “Maybe this seems like a rather niche point to make? but this is what I do – paleoclimate. So I notice and I care :)” applies to them as well. But herein lies a trap of some importance. Deniers and foot-draggers of various sorts want to get into the weeds, and specialists can easily be enticed into it. It’s the old battle between precision and accessibility. There’s no size that fits all, here. 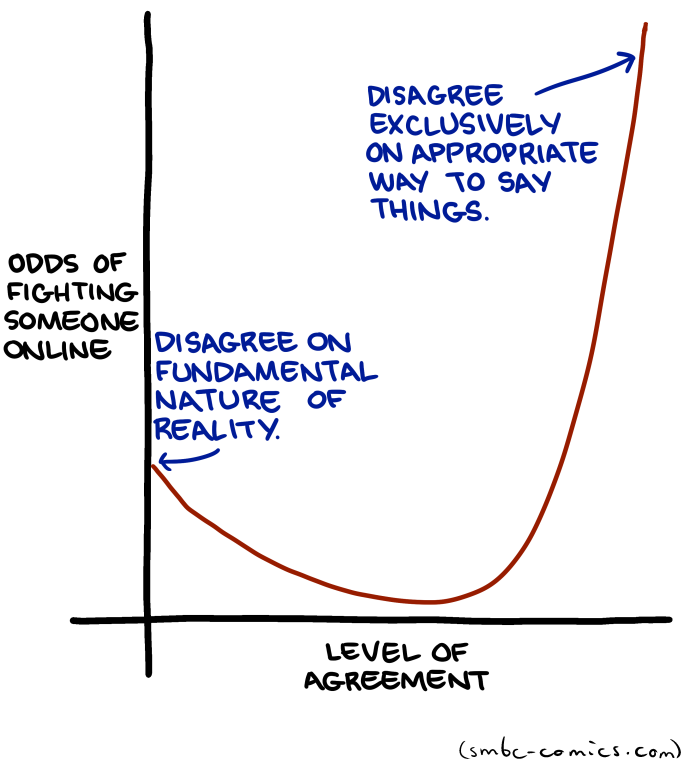 But xkcd has certainly hit a sweet spot. Kudos. Hands down best post on the XKCD comic! Nicely done indeed. Making people scroll through rather than seeing it on a single page should serve to make it memorable. Similar: Bayeux tapestry, a bit. Possibly scrolls, earlier. In my view, if you're going to critique some attempt at communicating a complex topic to the public, then it's worth first thinking about what they are trying to actually communicate, whether or not that is how it would be interpreted, and whether or not that is a reasonable interpretation of our current understanding. If it is a reasonable interpretation, and if it would be understood in that way, then that would appear to be a reasonble communication attempt. If it isn't, then fire away. However, given that we can probably find fault with any communication attempt, I think one has to be careful of simply finding reasons to criticise even if what is being conveyed is reasonable. Greg Laden responds here with lots of complaints about the archaeological gloss, and Kevin Anchukaitis is simply miffed. Also more from Chris Colose here. Everybody either loves or hates the graphic. I'm trying to discuss WHY it's interesting. It seems to me to have something to do with the general public not understanding regimes and orders of magnitude. This one will be second guessed a lot more than the average xkcd, apparently. I hadn't seen that XKCD about climate change, so thanks for drawing my attention to it. I clicked through to the links you provided that provide a more critical review of the comic, and there are some good points, but the other authors show off their knowledge by seeking every possible flaw in the comic rather than limiting it to the most relevant flaws. Greg Laden goes way overboard on his list of flaws. It doesn't matter to the climate data how many origins to agriculture there were or whether XKCD implied that it was only one. MT, I think that your analysis was more appropriate. That is a fine piece of comic. Just long enough not to include Oruanui eruption (well that was 26500 years ago) and enough text. Couldn't quite make a horizontal version to work well enough to be advertised on various blogs and in this, the scale and the resolution is anyway better selected. No, the graph on the right doesn't tell the same story. When you compress it, spin it with the Holocene climatic optimum, add in the fluctuations, give it an inane headline, what you end up doing is sucking up to the crazies. Which is exactly what the so called main stream media, and now you too, have done. The graph is not bad, but it is vulnerable to satire. Someone could (and someone probably will) replace the start and end dates with January and August as a way to make a cheap point. Others will just bring out graphs that have a larger time scale that dwarfs the period shown to show this period as not far outside of the norm. It is simply not true that everyone either loves or hates the graphics. You seem to have assumed I hate it, despite my communicating very clearly that I love it. But as an academic in certain areas, I'm a steward of both information/facts and the way in which our understanding of those areas influences society and culture. This is a great cartoon and it does all the good things. But it is also an example of using our past in a way that reinforces harmful misconceptions. It is my duty to point that out and ask that my colleagues interested in climate change but who themselves are not experts in paleoanthropology and prehistory, as well as cartoonists, learn about this widespread and important problem that we have in formal education and public information. If there was a great cartoon or graphic that made an important point about education, for example, but threw some basic physics under the bus in so doing, I wager you would ask for that to be fixed, since getting the physics right does not damage the message, and getting it wrong damages general understanding of physics (especially in a widely disseminated product). And you would be right to do so, and I'd likely agree with you. Here, however, what is being damaged is not esoteric knowledge that only the experts really need to know, but widespread conceptions that ultimately underscore privilege- and racism-driven thinking and action that ultimately hurts people. That is something that should be considered. I'm pretty convinced that you are not actually seeing my arguments, but rather, preconceived them and are tilting at a straw man. Greg, I asked you to propose alternative events and your answer was vague. I'd love to engage you on this but you don't seem to get that I simply don't understand what you are saying. If you want to mark points in time, imperial triumphs and technological breakthroughs serve well. Further, Randal has gone some lengths to escape the Western narrative as far as I can see. So I would like you to propose which events should be, corrected, which removed, and which added, while otherwiase preserving the design which you like. Just saying you don't like what is there is not helping the rest of us understand what it is you are concerned about. While I'm very happy about the xkcd graphic, I always managed to get its point across without it, usually by slamming the table and saying "bang, that's what's happening right now on a geological timescale". Now it seems here we got a case where even a graphic graphic doesn't help. That's a good point, but it would break our syndication setup. Will have to consider that. I didn't take Greg Laden's post as a criticism of the idea. It is sad that we cannot tolerate complexity even amongst ourselves. I read that he was very much in favor of it but thought it could be improved. I agree. I haven't had time to look at the detail, but in a differently designed world it would be possible to introduce some tweaks (no more than tweaks) that would represent a broader historical perspective. Given the job involved, xkcd's result is no less than spectacular. Though I joined him in this comment, since I've been looking at history lately, I do understand that a finished work of art - and this is a finished work of art - is not so easily revised after publication and dissemination. The big idea is so important and its hopeful audience should get the real message, which is not diluted by this quibble. It's an interesting area for thought, which human manipulations have resulted in how much climate change where. Empire building, exploitation and colonization resulted in massive deforestation over the last 600 years (possibly longer). There would be a clutter problem in that bit as well, since it's short relative to the whole. Oh for time to indulge these diversions. But I'm trying to get some painting done amidst the constant temptation to correct people "wrong on the internet." I don't think I can't tolerate complexity. I am simply admitting that I do not see what Greg is complaining about, and asking him what a revision would look like, whether it is worth doing or not. I will ask you too. If there's something Eurocentric about the timeline, about which I'm unconvinced, how would you fix it? mt, I was generalizing. In my life and in our election, one huuuge problem is perfectionism and idealism getting in the way of calling out real problems and making the adjustments to real life all humans must. You couldn't have told me this before I turned 60, I wouldn't have believed you. But "purity" is actually not a good thing. We need a little dirt in our lives. And again, like Greg Laden, despite my quibble, it is impossible not to praise xkcd's beautiful and well thought out visual. You appear not to acknowledge this, why? What is disturbing is that the more I look at history, the more the global predations of "civilization" which wasted vast swathes of the globe in the last millenium seem more the norm than the exception. I am concerned that we take a piecemeal view of the scale of global deforestation and the like. Our self-centeredness is supported by Genesis which states in unequivocal terms that the earth is put there for us to plunder. This will not end well. But all this is beside the point, which is that xkcd's graphic is 99.99% effective communication for his audience, and people with other cultural backgrounds will sill appreciate it. Deforestation is as old as civilization, i.e. not just a problem of the last millenium. The tragic thing is not this fact, but that civilization has never ever learned from this and happily continued overexploitation and overpopulation. On the other extreme, the desertification of the Sahara area was perhaps no problem at all, for it went slow, and people could simply move out in time.